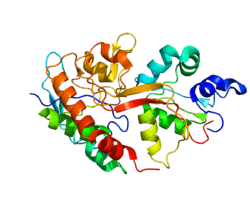 Glutamate [NMDA] receptor subunit epsilon-2, also known as N-methyl D-aspartate receptor subtype 2B (NMDAR2B or NR2B), is a protein that in humans is encoded by the GRIN2B gene. N-methyl-D-aspartate (NMDA) receptors are a class of ionotropic glutamate receptors. The NMDA receptor channel has been shown to be involved in long-term potentiation, an activity-dependent increase in the efficiency of synaptic transmission thought to underlie certain kinds of memory and learning. NMDA receptor channels are heterotetramers composed of two molecules of the key receptor subunit NMDAR1 (GRIN1) and two drawn from one or more of the four NMDAR2 subunits: NMDAR2A (GRIN2A), NMDAR2B (GRIN2B), NMDAR2C (GRIN2C), and NMDAR2D (GRIN2D). The NR2 subunit acts as the agonist binding site for glutamate, one of the predominant excitatory neurotransmitter receptors in the mammalian brain. NR2B has been associated with age- and visual-experience-dependent plasticity in the neocortex of rats, where an increased NR2B/NR2A ratio correlates directly with the stronger excitatory LTP in young animals. This is thought to contribute to experience-dependent refinement of developing cortical circuits. Evt 101, a selective NR2B receptor antagonist. This compound was tested as a potentially fast-acting antidepressant. In 2011 it was voluntarily withdrawn from a Phase II clinical study in treatment-resistant depression due to an unsatisfactory toxicity profile. ↑ "Diseases that are genetically associated with GRIN2B view/edit references on wikidata". ↑ "Drugs that physically interact with Glutamate receptor ionotropic, NMDA 2B view/edit references on wikidata". ↑ Monyer H, Sprengel R, Schoepfer R, Herb A, Higuchi M, Lomeli H, Burnashev N, Sakmann B, Seeburg PH (Jun 1992). "Heteromeric NMDA receptors: molecular and functional distinction of subtypes". Science. 256 (5060): 1217–21. doi:10.1126/science.256.5060.1217. PMID 1350383. ↑ "Entrez Gene: GRIN2B glutamate receptor, ionotropic, N-methyl D-aspartate 2B". ↑ Yoshimura, Yumiko; Ohmura, Tomohisa; Komatsu, Yukio (2003-07-23). "Two Forms of Synaptic Plasticity with Distinct Dependence on Age, Experience, and NMDA Receptor Subtype in Rat Visual Cortex". The Journal of Neuroscience. 23 (16): 6557–6566. ISSN 0270-6474. PMID 12878697. ↑ "The Effects of a Novel NMDA NR2B-Subtype Selective Antagonist, EVT 101, on Brain Function". NCT00526968. ClinicalTrials.gov. 2008-02-14. Retrieved 2010-08-19. ↑ "Phase II study with NR2B sub-type selective NMDA antagonist in treatment-resistant depression voluntarily terminated". evotec.com. 2011-05-18. Retrieved 2015-08-24. ↑ Wyszynski M, Lin J, Rao A, Nigh E, Beggs AH, Craig AM, Sheng M (January 1997). "Competitive binding of alpha-actinin and calmodulin to the NMDA receptor". Nature. 385 (6615): 439–42. doi:10.1038/385439a0. PMID 9009191. 1 2 3 Inanobe A, Fujita A, Ito M, Tomoike H, Inageda K, Kurachi Y (June 2002). "Inward rectifier K+ channel Kir2.3 is localized at the postsynaptic membrane of excitatory synapses". Am. J. Physiol., Cell Physiol. 282 (6): C1396–403. doi:10.1152/ajpcell.00615.2001. PMID 11997254. 1 2 3 Irie M, Hata Y, Takeuchi M, Ichtchenko K, Toyoda A, Hirao K, Takai Y, Rosahl TW, Südhof TC (September 1997). "Binding of neuroligins to PSD-95". Science. 277 (5331): 1511–5. doi:10.1126/science.277.5331.1511. PMID 9278515. 1 2 3 Sans N, Prybylowski K, Petralia RS, Chang K, Wang YX, Racca C, Vicini S, Wenthold RJ (June 2003). "NMDA receptor trafficking through an interaction between PDZ proteins and the exocyst complex". Nat. Cell Biol. 5 (6): 520–30. doi:10.1038/ncb990. PMID 12738960. ↑ Niethammer M, Valtschanoff JG, Kapoor TM, Allison DW, Weinberg RJ, Craig AM, Sheng M (April 1998). "CRIPT, a novel postsynaptic protein that binds to the third PDZ domain of PSD-95/SAP90". Neuron. 20 (4): 693–707. doi:10.1016/s0896-6273(00)81009-0. PMID 9581762. ↑ Kornau HC, Schenker LT, Kennedy MB, Seeburg PH (September 1995). "Domain interaction between NMDA receptor subunits and the postsynaptic density protein PSD-95". Science. 269 (5231): 1737–40. doi:10.1126/science.7569905. PMID 7569905. ↑ Jo K, Derin R, Li M, Bredt DS (June 1999). "Characterization of MALS/Velis-1, -2, and -3: a family of mammalian LIN-7 homologs enriched at brain synapses in association with the postsynaptic density-95/NMDA receptor postsynaptic complex". J. Neurosci. 19 (11): 4189–99. PMID 10341223. ↑ Nakazawa T, Watabe AM, Tezuka T, Yoshida Y, Yokoyama K, Umemori H, Inoue A, Okabe S, Manabe T, Yamamoto T (July 2003). "p250GAP, a novel brain-enriched GTPase-activating protein for Rho family GTPases, is involved in the N-methyl-d-aspartate receptor signaling". Mol. Biol. Cell. 14 (7): 2921–34. doi:10.1091/mbc.E02-09-0623. PMC 165687 . PMID 12857875. Nagy J (2004). "The NR2B subtype of NMDA receptor: a potential target for the treatment of alcohol dependence". Curr Drug Targets CNS Neurol Disord. 3 (3): 169–79. doi:10.2174/1568007043337409. PMID 15180478. Mandich P, Schito AM, Bellone E, Antonacci R, Finelli P, Rocchi M, Ajmar F (1994). "Mapping of the human NMDAR2B receptor subunit gene (GRIN2B) to chromosome 12p12". Genomics. 22 (1): 216–8. doi:10.1006/geno.1994.1366. PMID 7959773. Adams SL, Foldes RL, Kamboj RK (1995). "Human N-methyl-D-aspartate receptor modulatory subunit hNR3: cloning and sequencing of the cDNA and primary structure of the protein". Biochim. Biophys. Acta. 1260 (1): 105–8. doi:10.1016/0167-4781(94)00189-a. PMID 7999784. Müller BM, Kistner U, Kindler S, Chung WJ, Kuhlendahl S, Fenster SD, Lau LF, Veh RW, Huganir RL, Gundelfinger ED, Garner CC (1996). "SAP102, a novel postsynaptic protein that interacts with NMDA receptor complexes in vivo". Neuron. 17 (2): 255–65. doi:10.1016/S0896-6273(00)80157-9. PMID 8780649.